Last night on the mean streets of U2 Way, monolithic arena-rock gods U2 performed for the third consecutive evening on the Late Show With David Letterman. 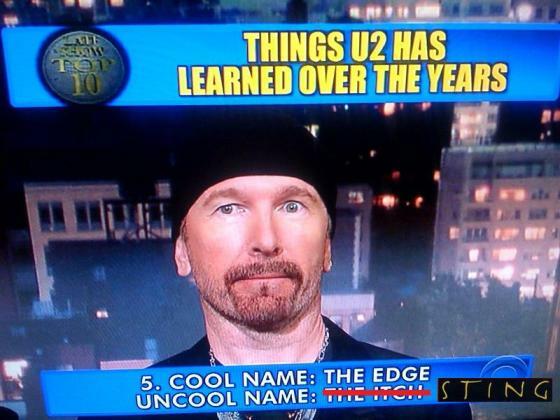 As is wont to happen in circumstances like this, Dave enlisted the bombastic Irish foursome to rattle off one of his patented top-ten lists, on the topic of “Things U2 Has Learned Over the Years.” The first few entries went pretty much according to plan, but when it came time for the Edge to rattle off the number five thing that the band has learned, David Howell Evans took it upon himself to go off script and put Sting on blast. Instead of reading “the Itch” in the place of his “uncool name,” the formerly ponytailed guitarist — perhaps emboldened by either Wayne Coyne or Jennifer Aniston — instead evoked the alter ego of the man born as Gordon Sumner. We’ve got video of the “Oh, snap!” moment for the ages after the jump. Since we don’t have any high-technology video-clipping software available to us, please jump ahead to 2:18 of the following YouTube clip to watch the dis for yourself. And for you purists, here’s the full top ten.